Well… not sure if I want to ride something called “SegFault”. Nice work though! It’s not Craig’s List. Its craigslist. Just like its not Face Book. And its not “an internet web site”, its just “a website”. I would like to change the rim to make it look more eye pleasing. Good job man, quite a healthy guy on the homemade segway and working perfect. Great ! OK! Great build! This is neat stuff, and very cool. But… (of course I have a but…) is it really a good tradeoff to have it balance on two wheels and have all the complexity of gyros and reverse gear? I would personally prefer to have two small wheels trailing and use the extra internal space for another battery. 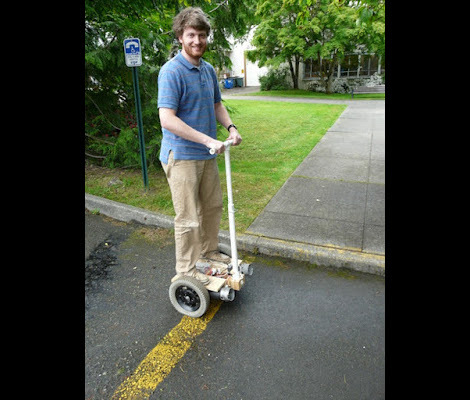 I do realize that it then stops being a Segway clone and becomes a simple electric scooter mod, but wouldn’t it be simpler, longer range, and wouldn’t need power to stand upright? Just sayin’. If only I’d grown up across the street from somebody smart enough to come up with something like this…. I’d be a millionaire by now. Thanks for the post, Hack a Day! Thanks for the kind comments, everyone—I am kind of surprised that no one’s mocked my PVC handlebars :). Ivan – Until I got the control loop working well, I wasn’t sure if I wanted to ride it, either. Trisha – I’ve been planning on adding new wheels (bigger and better looking), but just haven’t gotten around to it yet. mikelinpa – The balance hardware takes up very little space. I do have room for another battery as is, but I don’t know that I need the extra range. (I haven’t tested it yet, but I’ve estimated the range as ~5 miles, based on the specs of the sacrificial wheelchair.) I’ll have to think about this more, but I don’t think that much power is required to stand upright, and I’m pretty sure that the way the motors are driven inherently results in regenerative charging. I think the two-wheel balancing form is actually more stable than a four-wheel system with such a short wheelbase, and it’s definitely a lot cooler and was a more interesting and productive challenge to build. Ben – I’ve seen this other Segfault of which you speak, and I was bordering on distraught when someone else had the name on Hack a Day first. Though his was up and working first, it appears that my blog post announcing the idea and name predates his blog post announcing the same by exactly 3 months. :) I have to give him mad props for such a nice product, though, as well as for actual build logs and completing his project much faster. no need for the TVS diodes, install lower inductance capacitors on those H bridges. figure 100uF per amp of motor current, and if the motors are run pwm the whole time then the capacitor’s ripple current rating should equal the motor’s average current draw.